AS9100 is the internationally recognized Aerospace QMS Standard, that focuses on the systems necessary, to consistently provide quality products, processes and services. Aviation, space and defense industries, are among the highest risk and most regulated business sectors in the world. Supplier qualification for these sectors, mandates suppliers meet the compliance requirements of a quality management systems, such as AS9100, AS9110 and or AS9120. AS9100 specifically addresses aerospace regulatory, safety and reliability requirements for any aerospace organization; from design and manufacturing to maintenance and stockist distributors. Credentials required to pursue domestic and international business opportunities, as a qualified supplier, are satisfied with AS9100 certification. Every AS9100 certified company is included on the Online Aerospace Supplier InformationSystem (OASIS) maintained by the IAQG. This searchable database is available to companies in the aerospace industry and includes information about each supplier with purchasing contacts. Consider OASIS as a free, aerospace marketing tool. Intertek is a global AS9100 registrar and leading provider of aerospace certification services. 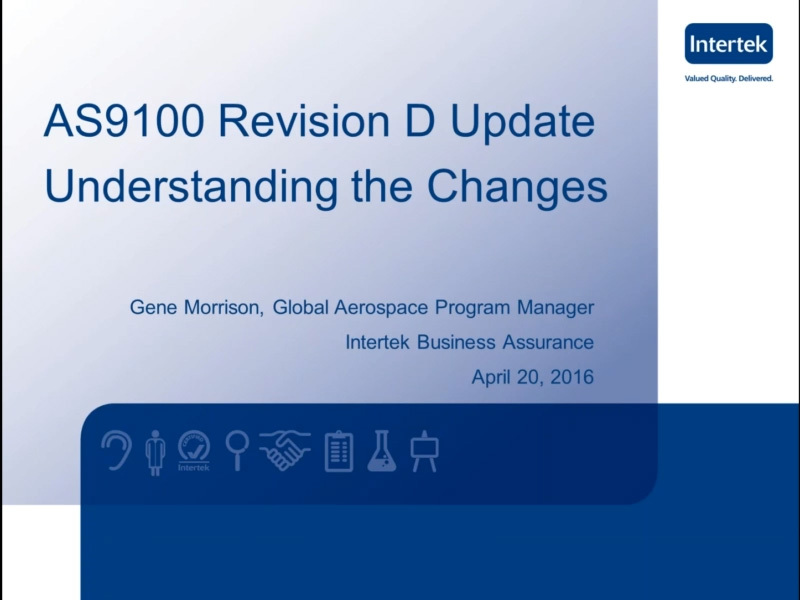 Intertek was among the first accredited registrars for the AS9100, AS9110, and AS9120 standards, certifying aerospace manufacturers, distributors, and service providers worldwide. Our industry experience and professional staff has helped aerospace suppliers globally, obtain the QMS certification (AS9100C, AS9110A and AS9120A) and meet the requirements necessary to pursue new business opportunities.